Barcrest actually operates under the name SG Gaming but their best-known online slots are still referred to by most players as being Barcrest games. Lets take a look at the games with highest payout percentages so you can see your expected return to player amount. In their current guise as SG Gaming, Barcrest do not regularly add new titles to their current portfolio of online slots games. That portfolio, however, does already include a number of recognisable and popular titles which the company introduced to the market before their more recent switch in focus to land-based terminals and arcade machines. Barcrest games found online are solely of the video slots variety, probably due to the fact that the company has always liked to produce games which are suitable both for online play and for playing via physical terminals and machines. Many of their games, for the same reason, did begin life as terminal games and were then transitioned online but a few titles, such as King of the Aztecs and Merry Money were developed solely with online play in mind. All of the Rainbow Riches slot titles are broadly themed around Irish mythology and specifically the likes of leprechauns, rainbows and pots of gold, all of which feature heavily within the games’ imagery and graphics (their payout percentages vary from 95-98%). As Barcrest (or SG Gaming) released further additions to their Rainbow Riches series of slots, extra bonus features and side games began to be included and the popularity of these titles shows little sign of abating. It is partly thanks to that popularity and notoriety of the Rainbow Riches series of slots that Barcrest remains a recognisable name within the online gaming industry. In truth, however, thanks to the recent rebrand of the company as SG Gaming and the fact that that new company’s main focus does not appear to be on online gambling, Barcrest is a name which online slots players are likely to hear less and less. Barcrest have just over 50 video slot titles in their collection of games with return to player percentages varying from just 94.09% right up to 99.00%. At the top that’s obvously seriously impressive and games such as Monopoly Big Event and Ooh Aah Dracula have to be considered some of the best slots for theoretical returns. At the lower end is Boulder Bucks with an RTP of 94.09% and games are staggered pretty evenly between that mark and the top returning titles. The average payout percentage for Barcrest slots comes in at 96.25%. That’s an impressive figure and is actually only second to NetEnt by our calculations. The fact they’ve a much smaller range of titles definitely helps them here but still credit must be given where it’s due. Barcrest were originally formed as long ago as 1968, primarily as a designer and manufacturer of analogue fruit machines in the UK. Thanks to the success of those machines, which quickly spread to be recognisable sights in pubs, chip shops, social clubs and other venues all over the country, Barcrest swiftly became the leading name in terminals and content in the arcade games and bingo sector in the UK. Having garnered that reputation as the leading light within what was a young industry, Barcrest rapidly expanded over the coming decade or so. That expansion saw the company reach essentially every corner of the UK and also expand into the increasing number of regulated markets across continental Europe. Through the 1980s and 1990s, the company continued to grow and also diversified the products they offered to customers, ultimately moving into the digital gaming industry. From there it was a logical step for Barcrest to take to begin producing games and products for the online gaming industry, and that move was ultimately spurred by the takeover of the company by US gaming giants IGT in 1998. Under the stewardship of IGT, Barcrest began to both transition their existing land-based terminal slots onto the internet and to develop a handful of new slots specifically for online casinos. A number of popular and well-known titles entered the online realm during this stage of Barcrest’s history, with the most famous undoubtedly being their range of Rainbow Riches slots. Having been under the ownership of IGT for 13 years, Barcrest was then acquired in 2011 by another American company, in the shape of the Scientific Games Corporation. The following year, in 2012, the Scientific Games Corporation merged Barcrest with The Global Draw – a British server based gaming company which they had acquired back in 1997 – to create a new entity known as SG Gaming. ‘leading provider of gaming solutions for the licensed betting office, arcade and bingo sectors in the UK’. As that description hints at, they do not now have a great deal of interest in developing online slots games or other similar software. Instead, they manufacture and sell physical video slot machines, betting terminals, fixed odds betting machines and other similar hardware as their main priority. 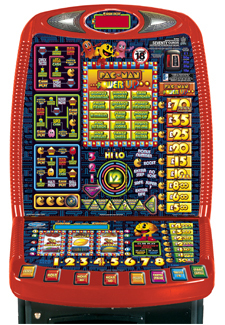 The company do, however, still also supply some new slots games for those terminals and there are a number of those which are also taken online. When most online gaming fans talk about Barcrest slots, however, they are generally referring to slots games developed during the company’s time under the ownership of IGT; many of which remain enduringly popular.